This stylish and durable wine opener corkscrew is of a professional quality but meant to be used by any and all wine enthusiasts who consider themselves a "Sommelier at Home." With this multifunctional tool, you can smoothly open any bottle with ease and present a glass of wine to your guests in the most elegant way. Looking for a gift that is sure to please just about anyone on your list? This corkscrew, with a gorgeous natural rosewood handle will certainly do just that; and rest assured it will be used again and again for many joyous and relaxing occasions. Have that one friend that has to dig through the kitchen drawer for five minutes only to pull out a cheap plastic wine opener that is sure to be the cause of a stuck cork and disappointing evening? Treat them to a Sommelier at Home corkscrew. They will be delighted by your thoughtfulness and saved from many more embarrassing moments. Designed to last through hundreds of bottles, this is corkscrew is made of durable stainless steel and natural rosewood, for both sturdiness and style. 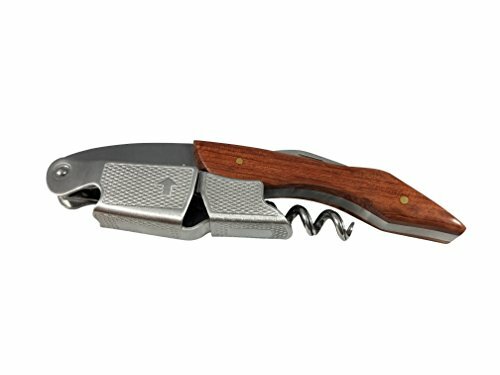 It features a double hinged fulcrum and precision cut groove in the corkscrew for ease of use. The serrated foil cutter and beer bottle opener feature make this a true all-in-one tool. INSPIRED BY WHAT TOP SOMMELIERS ALL OVER THE WORLD USE; BUT THIS ONE IS FOR SOMMELIERS AT HOME LIKE YOU! MAKES A GREAT GIFT for all of the wine lovers in your life. They will appreciate the high quality and elegance of this corkscrew. Pair the opener with a great bottle of wine for an excellent birthday or congratulatory gift. Keep a couple of extras on hand for last minute hostess gifts or favors. 3-IN-1 MULTIFUNCTIONAL TOOL - Serrated foil cutter is easy to use and makes this an all in one wine opening tool. Includes a beer bottle opener tool also, so you never have to carry around two separate openers. Keep one or two in your home bar area for gatherings; the small size makes it convenient for travel too! HIGH QUALITY - Crafted of premium stainless steel and rosewood, this corkscrew will last a lifetime. You'll find it to be heavy duty, sturdy, as well as beautiful to look at and display with the natural rosewood handle. This corkscrew will remove both natural and synthetic corks with ease. Don't ever have your evening ruined again by having a stuck cork in a fantastic bottle of wine. DOUBLE HINGED FULCRUM makes uncorking even the most difficult corks a breeze. It provides you with extra leverage and will remove even the longest corks. Impress your guests by opening any wine with ease and look like a professional sommelier at home. THE GROOVED CORKSCREW makes it less likely that your cork will break. It's these small quality details that make all the difference. Simple to wipe clean if needed. You'll use this again and again and it will become your go to wine tool. If you have any questions about this product by Sommelier at Home, contact us by completing and submitting the form below. If you are looking for a specif part number, please include it with your message.